The young Kirk and Spock make their individual ways toward a destiny in Starfleet. Because there are other stories in comics and novels that take place in between segments of the Star Trek movie, I've chosen to break the movie down into three segments in the chronology, representing the time periods in which they occur: James Kirk's day of birth ("Rebirth"), Kirk's and Spock's childhoods and decisions to enter Starfleet Academy ("Parallels"), and the maiden voyage of the Enterprise ("The Vengeance of Nero"). I've titled this segment "Parallels" because it tells of the trials and tribulations of child and teen Kirk and Spock which eventually lead them to enrolling in Starfleet Academy. The antique car driven by young James appears to be a 1965 Corvette Sting Ray. 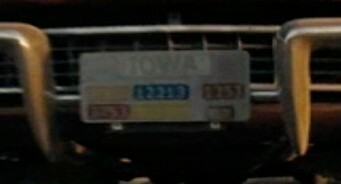 The large structures seen in the distance throughout the Corvette scene are part of the shipyards prevalent in Iowa in the 23rd Century. The dashboard phone that James answers at 12:15 on the DVD shows the Nokia logo on it. Nokia is a multinational communications corporation based in Finland and currently most noted for its cellular phones. Apparently they're still around in the 23rd Century! Maybe they designed Starfleet's communicators. The voice of Kirk's stepfather is provided by Greg Grunberg, best known as Matt Parkman on the 2006-2010 TV series Heroes and pilot Snap Wexley in the Star Wars series of films. The scene of young Spock answering questions from a myriad of computers is similar to the one seen in Star Trek: The Voyage Home when the recovering Spock is asked a plethora of questions to determine how well he is progressing after the return of his katra (essentially, his soul) at the end of Star Trek: The Search for Spock. The insults and fight with three of his peers that young Spock suffers through, as well as Sarek's admonitions afterward are similar to events that occurred in the original timeline as seen in the ST animated series episode "Yesteryear". Sarek's line here that "logic offers a serenity that humans seldom experience" is borrowed from a line that Spock says to his younger self in that same episode. After the fight with the bullies, at 16:06 on the DVD, notice that Spock has some green blood on his lip and a greenish bruise on his left cheek. When Spock asks his father why he married a human, Sarek answers that his ambassadorship to Earth made it a logical decision. This is similar to his response in the original series episode "Journey to Babel" when Spock asked him why he married her: "At the time, it seemed the logical thing to do." Spock discusses with his mother the Vulcan discipline of Kolinahr and purging of all emotion. Kolinahr is the same discipline Spock was attempting to complete in the original timeline at the beginning of Star Trek: The Motion Picture. At 20:11 on the DVD, a model of a Saturn V rocket appears in the background at the nightclub. The Saturn V was the NASA rocket that took U.S. astronauts to the moon and the Skylab space station from 1967-1973. The menu held by Uhura at 20:14 on the DVD reveals that the bar is called the Shipyard Bar. Notice that the pictures of food and beverage items on the menu change digitally every couple seconds. At the bar, Uhura orders a Klabnian fire tea, three Budweiser Classics, two Cardassian sunrises, a Slusho, and a Jack Daniel's. Jack Daniel's, of course, is a well-known brand of whisky. Budweiser is an American beer company, but there is not (yet!) a Budweiser Classic brew being produced (there is also a Budweiser sign visible behind the bar at 22:21 on the DVD). Slusho is the name of a drink used in two previous J.J. Abrams productions, the 2001-2006 TV series Alias and the 2008 movie Cloverfield. The Klabnian fire tea and Cardassian sunrise are unknown beverages, but Cardassians are an alien species seen in the Next Generation era of the original ST timeline. 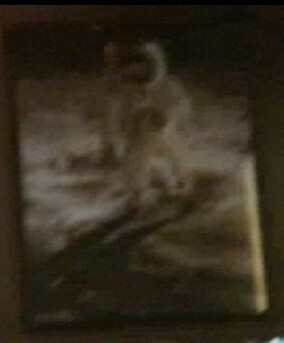 At 22:06 on the DVD, there is a poster of an astronaut walking on the moon during the U.S. Apollo program. This particular photo is of Buzz Aldrin during Apollo 11, from the first human moon landing. Captain Pike tells Kirk that Kirk's father didn't believe in no-win scenarios. In the original timeline, Kirk tells Lt. Saavik that he doesn't believe in the no-win scenario in Star Trek: The Wrath of Khan. Kirk's hometown is established as Riverside, Iowa. This is a real world town in that state. In the film, the Enterprise is built here in the Riverside Shipyard. A sign featuring the symbol of the United Federation of Planets can be seen in the background as Kirk gazes at the Enterprise under construction at the shipyards at 25:24 on the DVD. At 25:34 on the DVD, we see a sign at the perimeter of the Riverside Shipyard. At 25:47 on the DVD, notice that the wheels of Kirk's cycle have no spokes! The ongoing joke of Kirk trying to find out Uhura's first name may be a nod to the fact that she was not given a first name throughout the entire run of the original series, even giving rise to fans making up names for her as the syndicated reruns rose in popularity. It wasn't until the authorized book Star Trek II Biographies by William Rotsler was published in 1982 that "Nyota" was established as her name. Previous to this, some fan publications had suggested it was "Penda" and the Star Trek Role-Playing Game published by FASA from 1982-1989 stated it as "Samara". As the shuttle takes off with Kirk and the other cadets aboard, a small bit of the original Star Trek music theme is heard. Pages 32-69 cover the events of "Parallels"
On page 33, Spock identifies a piece of Earth music as having been composed by John Lennon and Paul McCartney. Both men were members of the rock and roll band the Beatles in the 1960s, as well as having impressive solo careers after. On page 35, when Spock attacks the Vulcan boy who bullies him, the bully attempts a nerve pinch, but Spock avoids it. The book reveals that the boy walking along the road as Jim drives by in the Corvette is his big brother, George, Jr., who has decided to leave home because he doesn't get along with their stepfather, Frank. The book reveals that the Corvette is not actually Frank's, but belonged to Jim and George, Jr.'s real father, George Kirk (killed in "Rebirth"). On page 41, Frank is watching the televised "big game" from Cairo. The type of game is not specified. Presumably, the "Cairo" referenced is the capital city of Egypt. The book reveals that Jim was an obedient, well-mannered child until the day he took his joyride in the Corvette. He was prompted to race off with it while washing it for his stepfather after his brother decided to leave and also learning that Frank had decided to sell the car, which had originally belonged to their father. Page 51 reveals that the Shipyard Bar is located in the city of Storm Lake, Iowa. Page 51 also mentions the cities of Washington, Moscow, and Beijing. These are the capital cities of the United States, Russia, and China. Page 51 also reveals that Uhura is from the region of East Africa. Uhura says habari to the bartender when she enters the Shipyard Bar. Habari is a Swahili greeting, standing for "what's the news?" Page 53 mentions that Uhura has been hit on in bars and shops around the world from Dar-es-Salaam to Des Moines. Dar-es-Salaam is the largest city of the African nation of Tanzania. Des Moines is the capital of Iowa. On page 54, Kirk remarks to Uhura that she's a Starfleet cadet preparing to go, "Out there. Thataway." In the original timeline, Admiral Kirk spoke these same words at the end of Star Trek: The Motion Picture as he was telling Sulu where to guide the Enterprise next. The book later seems to suggest that young Kirk has a habit of wandering no particular direction in life, just "thataway." On page 59, Captain Pike fears that Kirk will go through his life making the acquaintance of every jail from Chicago to St. Louis. Chicago is a city in Illinois and St. Louis is a city in Missouri. The two cities are about 300 miles apart and their states border Iowa, implying that, besides being in constant trouble with the law, Kirk would never go anywhere in his life if he didn't focus on a new path. On page 66, Kirk seems to refer to a paper-pusher as a "psion-pusher". I'm not sure what a psion is though! Since there does not seem to be a lot of paper usage in the 23rd Century, presumably the term has something to do with data entry via datapads or data sheets. Additionally, Psion was the name of a company in the real world that designed and manufactured mobile handheld computers, but was but out by Motorola in 2012. On page 69, Dr. McCoy is telling Kirk how he got fleeced in his divorce and remarks, "Sometimes I think the Klingons have the right idea." According to the Star Trek: Deep Space Nine episode "The House of Quark", a Klingon divorce is performed by one spouse knocking the other to the ground, saying "Our marriage is done," and spitting on the other.